Morpheus Photo Animation Suite v3.00 is an excellent application that will allow you to create stunning visual effects, with professional results. Using the technique Morphing (processing of images based on morphology of objects) Morpheus Photo Animation Suite v3.00 can transform your images and photographs with magnificent effect. 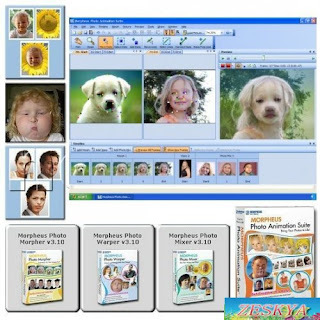 Morpheus Photo Animation Suite v3.00 can, for example, a sequence of photos of a person from childhood to adulthood, it will become a seamless transition, or change the image of a person to that of an animal, a flower , And much more!. Morph, Warp Mix & photos!